Showcases Coyle’s googly-eyed series where she took pictures of her food after using googly eyes and smiles cut from paper to make creatively, smiling food art. Bored Panda included an article on Coyle’s magazine collage portraiture work. The piece features several images of collage portraiture she’s made over the years. Bored Panda featured a brief write-up on Coyle’s work as well as several images of her collages. Coyle was interviewed on the website Workspiration, which features interviews with a variety of illustrators, designers, and developers. The interview focuses on her background and inspiration. Featured a write-up on Coyle as well as a variety of images of her collages. Cerise Press is an international online journal based in the United States and France. It focuses on literature, arts, and culture. Online publication that focuses on happenings in Charleston, South Carolina. This article discusses the work that Coyle displayed at the Charleston City Gallery in her “From Fur to Feathers – Animal Collages” exhibit. Megan was included in E-junkie’s list of “The Best Art & Artists in 2011.” The list includes artists that E-junkie interviewed throughout 2011. Megan was interviewed for their blog in November. Megan discusses her writing and illustrating process for her first children’s book, Duck & Fish, and how she uses a narrative in her other art projects. Bourgeon Online is an online publication that focuses on art in the Washington, D.C. area. E-junkie featured Megan as the Artist of the Week for the week of November 1st. They interviewed her on her art, process, and plans for the future. E-junkie blogs about small business, self publishing, and internet entrepreneurs. Duck & Fish, the first children’s book Megan wrote and illustrated, was featured in the All Things Paper blog. The post shares a couple illustrations from the book alongside the work of a quilling artist. All Things Paper is a blog that focuses on creative paper art and paper craft. Article from Elon University’s website that focused on Coyle’s work as a collage artist and how she got started with a career in the arts. It includes a bit of background on her training in college with creative writing and painting. Website that featured a write-up on Megan’s goals, inspiration, and current work. Artsy Shark is a site dedicated to emerging artists. Blog post that showcased ten of Megan’s collages alongside a write-up on her artwork. The Neatorama Art Blog features a variety of indie artists ranging from illustrators to painters. Megan’s animal collages were spotlighted in the All Things Paper blog – a blog that shares the work of paper artists. The post discusses Megan’s process and includes images of her latest work. WeLoveDC is a website that includes articles on different events and attractions in the DC area. The site posted a write-up on Megan’s solo show at the Art League Gallery, “Stories in Paper,” and included some information about her technique. Megan discusses how she got involved with collage, her process, and what she’s currently working on. 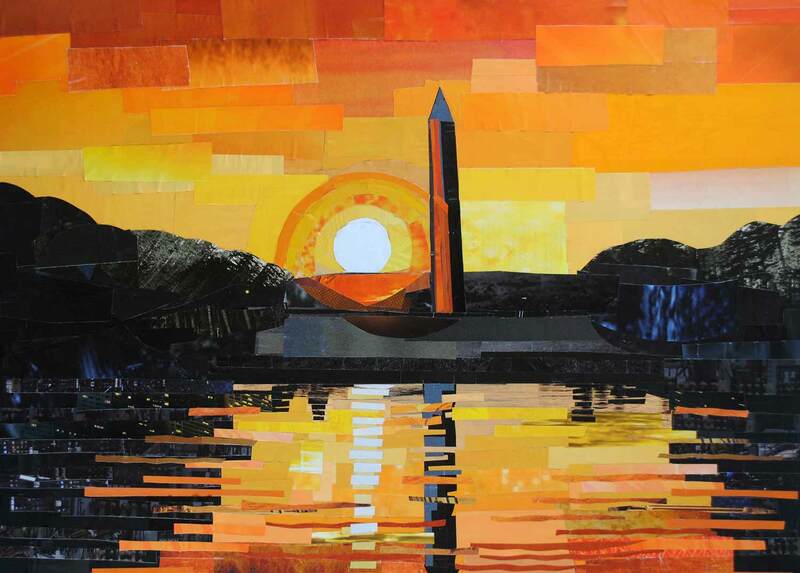 Bourgeon Online is an online publication that focuses on art in the Washington, D.C. area. Artwork posted on Not Your Average Ordinary – a blog that explores life and style. It emphasizes style of the body, home, mind, and soul. During the 2008 presidential campaign, Megan created a series of Obama collage portraits. “Blue Barack Obama” appeared on the Art of Obama website. Art of Obama is a blog dedicated to sharing artwork inspired by President Obama. The online art magazine, ARTzine online, featured Megan’s artwork on its homepage. Megan was also featured in their online artist gallery. Designer Patricia van Essche included a write-up on Megan’s art in her online blog—PVE design: to design, create and inspire an artful life. Jessie Cacciola, a writer and photographer, interviewed Megan about her artwork, process, goals, and inspiration.